One elderly YouTuber/world grandpa has taken the internet by storm, all through the power of good, old-fashioned manners. Nilson Izaias is a senior citizen who loves to post stories about the flowers and fruits in his garden. As January came to a close, Nilson had a very respectable number of subscribers – approximately 7,000 – but did not let this go to his head. 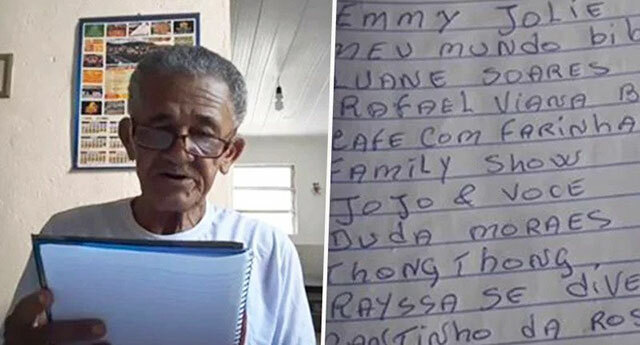 With what must have taken significant effort, Nilson wrote down all the names of his subscribers in a notebook, as a means of thanking them. He then showed the list in a heartwarming, gratitude filled video. Nilson’s loyal fanbase have shown their appreciation for this lovely man, referring to him fondly in the comments as ‘friend’ or ‘grandpa’. That’s a lot of composition notebooks to fill. Since the original post, Nilson has made multiple thank you videos, all of them equally uplifting.